DANNY PHILIP, Prime Minister of the Solomon Islands, thanked Mr. Ban for becoming the first Secretary-General to have set foot on a Pacific small island developing State with least developed-country status with his visit to the Solomon Islands earlier this month. The current General Assembly theme, which focused on mediation in the peaceful settlement of disputes, was “fitting and timely”. Multilateral diplomatic and political capitals needed to take centre stage over military solutions that might lead to long and protracted conflicts. In that vein, the Solomon Islands — whose population spoke some 87 different languages — was committed to building a multicultural and cohesive society with equal opportunities for all. A dedicated Government ministry was in its third year of working to build bridges between former conflicting parties within the Solomon Islands, he said. The United Nations needed to make a “special outreach” to countries with special needs, he stressed, especially those lagging the furthest, to assist them in operationalizing outcomes of global agreements. The international community must honour its commitments to do so by giving sufficiently to ensure economic transformation in least developed countries and small island developing States. Multilateralism was the basis of the foreign policy of the Solomon Islands, and the country had opened its second Permanent Mission to the United Nations in Geneva in June. It hoped to see that action reciprocated with an enhanced United Nations presence in the Solomon Islands. The current system was “over-regionalized”, and had seen problems grow in the Pacific. Additionally, 5 out of the 12 Pacific countries were listed as least developed. The Solomon Islands, as one such nation, applauded the adoption in May of the 10-year Istanbul Programme of Action for least developed countries. Partnership was critical to supporting investment in income-generating activities, employment creation, infrastructure development, rural agricultural development and investment in small-holder farmers. Solomon Islands was reaching out to 85 per cent of its population in rural areas, and was currently implementing parallel reform processes in both sectoral and constitutional land-reform programmes. The country supported the call for the Secretary-General to conduct a structured discussion on a post-2015 Millennium Development Goals-process. “We must all realize and admit we will fall short of achieving the MDGs come 2015,” he emphasized. That meant looking at the Goals from a sustainable development perspective. On climate change, he called on the Secretary-General to garner the necessary political will from developed partners to adopt a second commitment period in Durban, under the Kyoto protocol. Problems associated with climate change were growing challenges for the Solomon Islands. Among practical measures taken, the Government was planning the relocation of the national referral hospital to a higher ground; efforts were also under way to build a resilience policy on food and water security. The country was grateful for the growth of South-South cooperation and its support from countries including Cuba, India and Papua New Guinea, he said. As a post-conflict State, it remained engaged with the Australia-led Regional Assistance Mission to Solomon Islands. It also hoped to join other Pacific countries in having its police force participate in United Nations missions in the future. 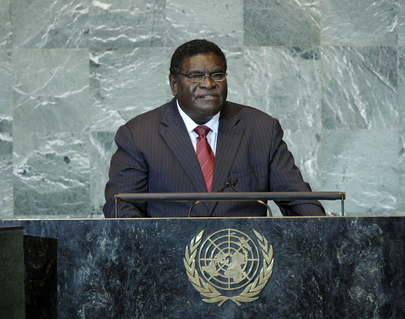 Solomon Islands believed in dialogue and engagement with all countries of the world, including Fiji. It had established relations with more than 27 countries since the current Government came to office. On a related issue, he called on the United States to unconditionally lift the economic blockade against Solomon Islands’ development partner, Cuba. Turning to the conflict in the Middle East, he said his country supported the work of the Quartet. Noting that two thirds of the United Nations Member States recognized the State of Palestine, he added that the international community must have the “strength and stamina” to act decisively and build on the two-State solution. Finally, the Solomon Islands continued to support the intergovernmental negotiations for expansion of both permanent and non-permanent seats in the Security Council. It also joined other small island developing States in calling for a non-permanent seat explicitly for those countries.